I’m going to title this, How I Got My Man Card Back. Now, how I lost it is a whole other story, but the important thing is, it’s back. I may have lost it again after going to Rotunda, but I grabbed it back on a recent trip to Kentucky Fried Chicken. I’ll tell you guys all about it later. 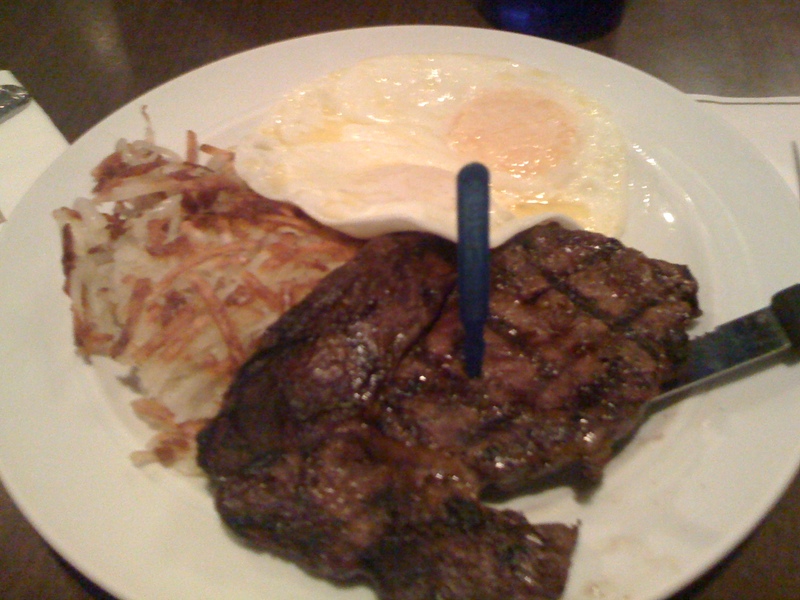 While taking a stroll on the Vegas strip, I noticed a huge sign that read “T-BONE STEAK AND EGGS – $5.99 – 12am – 6am”. I thought to myself, Gee! What a deal! I kept talking about it with my travel companions, and we committed to taking them up on the offer. The Victorian Room is in the back of Bill’s Gamblin’ Hall and Saloon. Walking through the casino, you could tell you weren’t having martinis in the glitzy lounge-singer-esque side of Vegas, instead you were knockin’ back some brewskies with the starving college version. The dining room itself looks like it’s been around for a long time. The red vinyl booths were burgundy and worn, unlike the bright red booths shown on their website advertisement. The clientèle after midnight consisted of broke gamblers, drunk night club patrons that wanted to end the night and our table, the smart penny pinching group of Asian dudes looking for some cheap meat. It was kind of funny, seeing the table next to us, where a guy was tipping his head up-and-down due to heavy inebriation. Our waiter took forever and our forks were mostly dirty. Definitely a place to test your immune system. All real manly men are in constant search for meat. I… can’t grow a full beard or chest hair, so I only search for meat when I’m in need of it. You can kind of say I’m a Cullen in a manly men’s world (Author’s Note: It’s comments like that, where I lose my man card). Steak and Eggs – I ordered a Medium Steak because with prices like that I’d really have to question the quality and cleanliness of the meat. The meat was tough, but it was saved by all the butter they used to cook it. Everything is better with butter. Pour some A1 on that sucker and we’re golden. The Eggs are cooked to order, so I had “Over Easy”, that tasted the way Denny’s eggs would taste. Now the part that really made this meal awesome, the side surprises. Hash Browns and Toast. I had no clue that a $6 meal could gather so many different things onto my plate. All I can say is, if you want something affordable really late at night, and you are poor and/or cheap, this is an awesome place to try.